FCRE is an organization of people retired from educational institutions. Active members include teachers, administrators, superintendents, support personnel, custodians, bus drivers, cafeteria workers, and others who retired from or worked in schools in northern Virginia or elsewhere. Associate members are sponsored family members or friends of present and former FCRE active members. As of January 1, 2018 we have 737 members living in 33 states. FCRE is a 501 (c) (7) organization incorporated in the Commonwealth of Virginia. Luncheon Program Meetings are held usually on the second Thursday of September, October, December, February, April, and June in the Fairfax, Virginia, area. See the Calendar of Events for details on upcoming luncheons. FCRE Advocate, published nine times annually, brings you news of upcoming FCRE programs and activities, feature articles on health care, finance, consumer awareness, travel, exhibits, performances, and federal and state legislative actions of concern to retirees. Periodic updates will be posted on this website on the FCRE Advocate page. FCRE Member Services-Tours presents information concerning travel opporunities. Trips in the past have been to Ireland, Hawaii, and San Antonio, to mention only a few of the many offered. In addition, FCRE members have cruised the canals of Holland, did sightseeing in Belgium, and topped off this trip with a visit to the magnificent tulip fields. See the FCRE Tours page for details. NEW - we now offer day trips through our expanded travel program that includes the Shillelagh Travel Club. Member Activities Groups include book discussions, bridge, film screenings, and afternoon teas in area inns and museums. See the Calendar of Events for listing of some current activities. The W. Harold Ford Scholarship Foundation, Inc., a subsidiary of FCRE, awards scholarships to Fairfax County, Virginia, senior high school graduates who intend to pursue higher education leading to a career as an educator. The W. Harold Ford Scholarship Foundation, Inc. is incorporated in the Commonwealth of Virginia. See Scholarship for more information. The Legato School Museum, the last of Fairfax County's one-room schoolhouses, is maintained and operated by FCRE. It's been restored and furnished much as it would have been over 100 years ago. 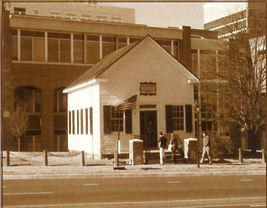 The building is located on the grounds of the old Fairfax County Courthouse on Rt 123 (near Rt 236 - Main St) in central Fairfax City. The schoolhouse is open on certain weekends and holidays, and by appointment. See the Calendar of Events for a listing of future open days for the museum. Thank you for visiting the FCRE web site. Please visit our other links, and return often to get updates on our tours and activities.